CertainTeed was recently tapped to provide a stunning ceiling system to Southwest Airlines for its Network Operations Control (NOC) center at the airline’s recently built Training and Operational Support building in Dallas. The new $30 million facility is exceptional for both its sophisticated design and state-of-the-art functionality – the architect even likened the center to a set from a James Bond movie. If you are not familiar with what the NOC is, it is essentially the heartbeat of the carrier’s entire air operations, responsible for tracking 3,500 daily flights. Literally no plane can fly and no crew or maintenance can be scheduled – anywhere – without the go-ahead from agents within the center. Hundreds of people work in the NOC, which is a room live with activity 24 hours a day, seven days a week. According to BOKA Powell, the Dallas-based architecture firm who created this jaw-dropping structure, the intent behind its design was twofold: to create a beautiful, structurally sound facility and to organize employees for efficient, streamlined work. Let’s just say mission accomplished. Structurally speaking, the building is essentially a high-tech bunker that can sustain operations through an emergency the size of a Texas F4 tornado. The interior, which is reminiscent of an airplane’s wings, plays with design elements to expedite communication among employees. 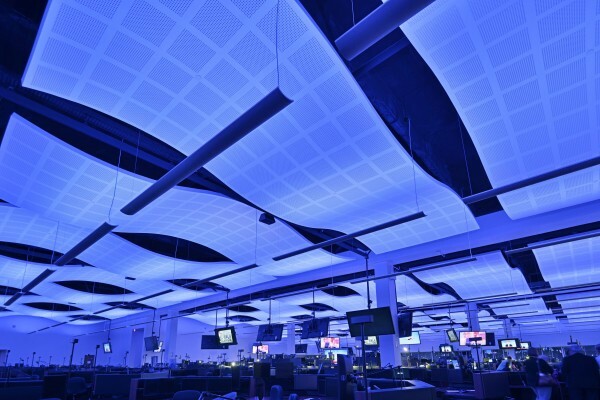 A beautifully curved, acoustic ceiling took the leading role in this effort by providing an NRC of 0.70 and offering a high light reflectance to disperse the center’s ambient blue lighting installed to keep employees alert. Pictures capture the essence of this sleek space better than my words can, so I’m posting a few here. If you want to learn more about this project, our Ceilings team recently uploaded a case study that delves deeper into the details. I encourage you to check it out. See for yourself how this smartly designed space mirrors the top-notch brand that is Southwest Airlines.